Don’t worry, ‘synergy,’ ‘low-hanging fruit,’ ‘incentivize,’ and ‘mission-critical’ also made the list, according to a new CareerBuilder survey. It’s mission-critical that we circle back on this important matter of corporate jargon in the workplace. Let’s focus on the low-hanging fruit with a small group first and then loop everyone in. Being proactive about our learnings will really incentivize the group to focus on the most critical action items and value-add for maximum impact. Let’s start high level, drill down from there, and circle back after lunch to figure out next steps. Wait, what? Annoying, right? If you’re anything like me, corporate jargon makes your skin crawl. In today’s workplace, however, it’s sometimes hard to get away from. We’ve likely all been guilty of at least one of the business buzzwords below. Navigating workplace issues can be tricky enough without throwing flowery, cliché (or just plain made up) vocabulary words in each other’s faces. It only takes one brave person to turn “outside the box” into “creatively” or “let’s circle back” to “I’ll call you”—and suddenly, we can begin to peel back the layers of complexity and really talk honestly to each other. Grasping for an original thought or non-business-speak term that describes what we want to achieve can sometimes be difficult, but it also makes it easier for others (inside or outside our workplaces) to understand us. It brings a fresh perspective to the same old “strategy planning session.” And it can make tasks easier, not just for employees who have been with the company for some time (and have deciphered the internal lingo), but for new employees, for whom clarity and simplicity is essential while getting used to a new role. Let’s stop wasting each other’s time and dumbing each other down with meaningless buzzwords—and start saying what we really mean. Here are a few examples of buzzword-worthy statements, each followed by an example of a simplified version. Dig around in your own emails—I’ll bet you have some examples to work with too. Sometimes, simpler words actually give us room to add more context around a situation. 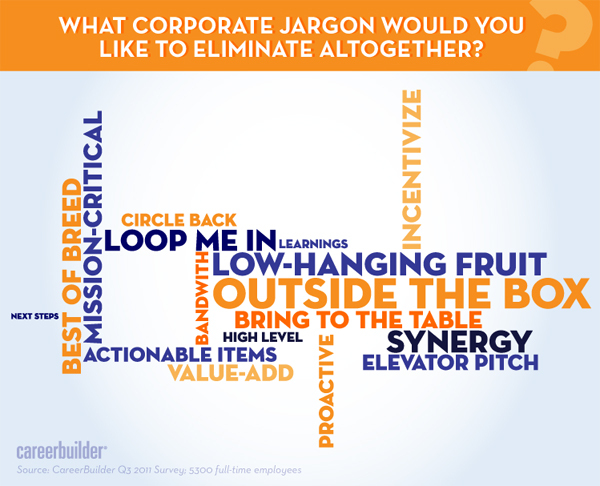 What are your biggest corporate jargon pet peeves—or which are you most guilty of overusing? Amy Chulik is a content strategist at CareerBuilder and writes for CareerBuilder’s employer-focused blog The Hiring Site, where a version of this article originally ran.